Mónica Acosta (she, her, hers, ella) was born in Durango, Mexico and immigrated to the U.S. at the age of three. She grew up just outside Los Angeles, California and moved to Denver in 1999, which she now calls her home. 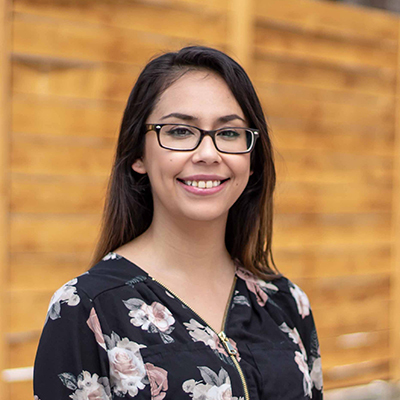 Monica began organizing as a youth leader with Padres & Jóvenes Unidos (PJU), working to protect bilingual education in Colorado and to transform her high school, which at the time was one of the lowest performing schools in the state. 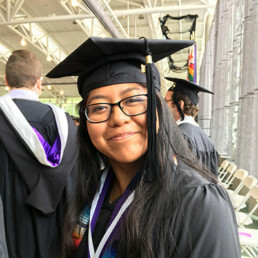 As an undocumented student, Monica was at the forefront of laying the foundation for Colorado’s immigrant youth movement that was instrumental in winning in-state tuition for undocumented students and DACA. Monica graduated from the University of Denver in 2008 with a B.A. in Sociology and Spanish. Moving through the leadership pipeline, she has continued her long trajectory with PJU, the place she refers to as her “political home.” Trained in transformative organizing, she currently serves as PJU’s Organizing Director. In this role, she is responsible for politicizing and training the next generation of community organizers fighting for economic and racial justice in Colorado and beyond. In her free time, Monica enjoys reading, writing, interior home design and spending time with loved ones. Creating a space with my fellow peers to reimagine what is possible and what we can achieve if we truly unleash our individual and collective power. And in doing so, gaining the skills and tools critical to advance our long-term vision for movement building necessary to win BIG things for our community. 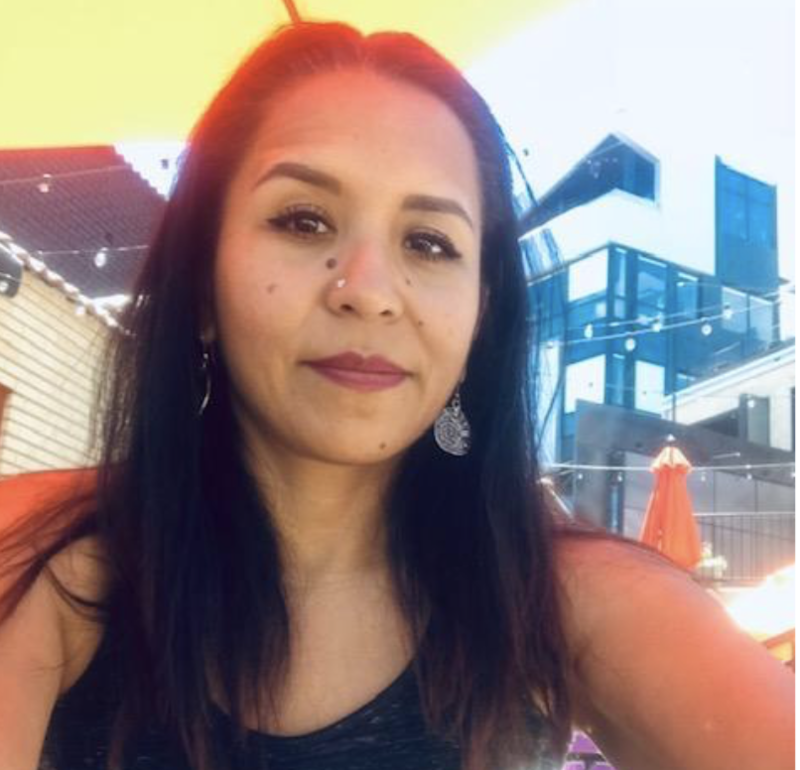 Originally from Guerrero, Mexico, Yuridia Bahena (ella, de ella, she , her, hers) has lived in Denver, Colorado since 2001, and currently works as a Program Manager for Re:Vision, a community-based nonprofit organization. Yuri has always had a passion for community and for cooking. 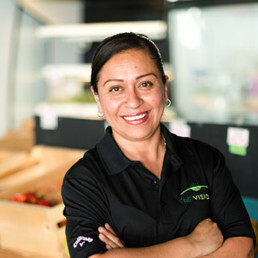 In 2010, Yuri signed up to participate in Re:Vision’s backyard garden program and, seeing her passion for community, in 2011, Re:Vision asked her to join their staff as a Community Promotora. In 2014, building on her expertise and passion for cooking, Yuri was promoted to Kitchen Program Coordinator, overseeing all the nutrition and cooking classes Re:Vision offered. That same year, Yuri became a founding member of the Westwood Food Cooperative, and has been an key leader on the board since then, now serving as the Vice President. She enjoys spending time with her three kids and grandson. I am looking forward to learn to forming a movement to fight for social justice in Colorado, to have a more stronger and resilient community. Dr. Eleonora (Ellie) Cahill (she, hers) has been working with families impacted by the complexities of trauma, poverty and racial oppression for 25 years. Dr. Cahill began her career as a high school English teacher before serving as Director and President of Breakthrough Cambridge, a non-profit agency serving at-risk youth and their families. As a clinician, she has provided trauma-informed, equity-focused services within public and charter schools, community agencies, pediatric and public hospitals and in primary care settings. Through this work, Ellie has grown to passionately believe in the resiliency of the human spirit, the tenacity of community, and the unsurpassed capacity for healing. Ellie holds a strong anti-oppression lens and is committed to promoting trauma-informed communities which actively address race-based and cultural disparities. She holds a PhD in School, Community and Clinical Child Psychology from University of Pennsylvania and a master’s degree in Risk and Prevention for Adolescents from Harvard University. Currently, Ellie is the Co-Founder of Resilient Futures, a non-profit whose mission is to promote safe, equitable, resilient communities for all youth. I am looking forward to engaging in a collective movement with my fellow social justice leaders that works to build and transform the capacity of leaders of color to effect lasting change within the communities we serve. Fatuma Emmad (she, hers) is the co-founder and director of Frontline Farming. She previously worked as the Director of Urban Farms for Groundwork Denver, is an adjunct Professor at Regis University in the Community Food Systems Minor and is the owner of Bountiful By Design (a sustainable high end landscape company). Fatuma was born in Denver and raised in Denver and Ethiopia. Fatuma has worked farming organic and heirloom vegetables on her own acreage as part of a land co-op, setting up farms for restaurants, and as farm manager for multi acre community farms in Milwaukee and Denver. Before becoming a farmer, Fatuma was a political scientist who engaged in issues affecting marginalized farming communities such as the push for genetically modified seeds across Sub-Saharan Africa. She believes in resistance by the world’s land caretakers to single solutions for crop productivity and seeks to work on re-framing ideas of food security. 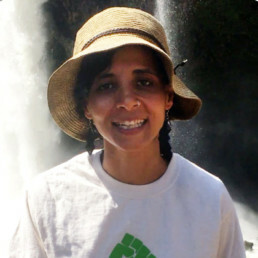 Fatuma has been certified and teaching yoga since 2004, is a graduate of the Center for Agriculture and Ecology at the University of Santa Cruz, and a member of the Denver Sustainable Food Council. I am excited to grow with a group of people who face the same challenges I do in working for social change in Colorado. I believe there is strength in unity. Elisabeth Harper Epps (she/her/hers), JD, is an abolitionist, activist, legal advocate and analyst based in Colorado. 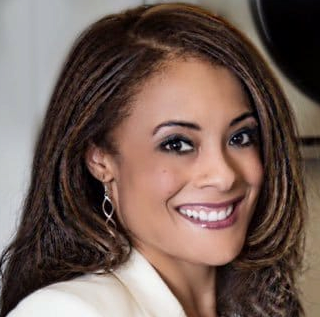 A former deputy state public defender and a graduate of the University of Virginia School of Law, Elisabeth serves as Founder/Director of the Colorado Freedom Fund (CFF) and Co-Lead of the Denver Justice Project (DJP). Elisabeth was raised in America’s south by an activist mother, and upon becoming a mother at age 16 Elisabeth raised her own now young adult son in the same activist tradition. For over two decades Elisabeth has been active in building political power and organizing around social justice, since long before she knew formal terms for the activity that would become her life’s work. 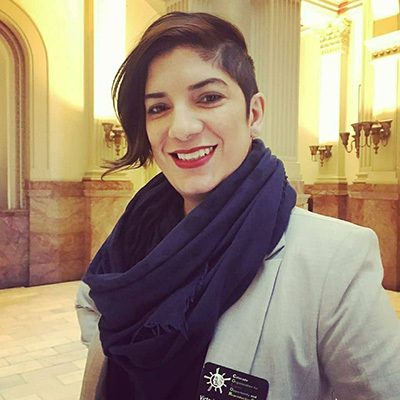 As Co-Lead of Denver Justice Project Elisabeth is committed to its three goals: transforming law enforcement; ending mass incarceration; achieving racial justice. From her direct action work with DJP a new initiative was launched to restore the presumption of innocence to people awaiting trial in Colorado—the Colorado Freedom Fund. CFF is a constituent-led organizing project to pool community resources and buy freedom for people languishing in Colorado cages only because of their inability to afford bond. A revolving bond fund, CFF is dedicated to one mission: ending money bail in Colorado and ensuring bond is not replaced with equally carceral options. As Founder/Director of the Colorado Freedom Fund, Elisabeth manages CFF’s day-to-day operations of reducing harm to people hurt by money bond while leading CFF’s policy efforts to abolish cash bail entirely–in Colorado, and beyond. Elisabeth is most proud of her son who is an outstanding kind brave person, an exceptional athlete, and a college senior. Her son and her newborn triplet nephews are the motivation and love for all her abolition efforts. In addition to adoring the four aforementioned humans, Elisabeth enjoys basketball, building with her extensive LEGO collection, travel, studying languages, and logic puzzles. I am thrilled to join the 2019 TLC cohort; the timing couldn’t be better. It is an honor to enter a community of people dedicated to cultivating sustainable leadership across Colorado’s ecosystem, learning and modeling real accountability work, and having courageous conversations that usher in progress across our disciplines. How exciting to collaborate with folks committed to collective liberation on all fronts, particularly fostering Black/Brown/Indigenous unity. My liberation depends on your liberation, and I’m humbled to build with people who believe the same. 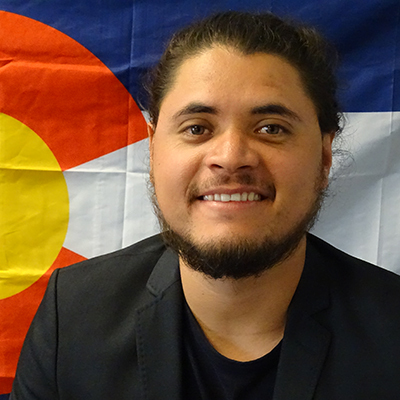 Alejandro Flores-Munoz (he/his) is the Program Director for America Votes Colorado and a self-taught entrepreneur. Alejandro’s mother brought his family to the United States in 1997 and instilled strong progressive values in him from a young age, introducing him to organizing and local campaign work in Santa Ana, CA. 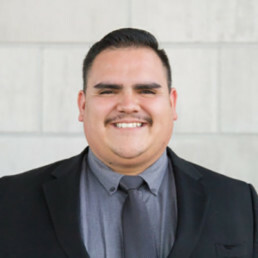 After years of working on state and local elections in California and a successful campaign of his own for Student Body President at Santa Ana College, Alejandro began working at Grassroots Campaigns where he lead campaign projects in New York City, Boston, Las Vegas, Philadelphia, and Denver. 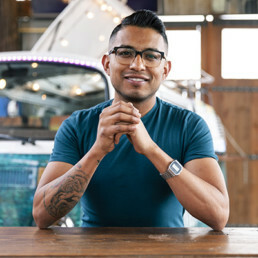 Alejandro is also driven by a strong sense of entrepreneurship that inspired him to open two businesses, Unum Sunglasses, and Progressive Button and to become a partner in Stokes Poke, a Denver Food Truck. Alejandro has received several notable honors, including a proclamation from the City of Santa Ana naming June 2nd, 2015 Alejandro “Alex” Flores Day for his service to the city and being selected by Denver Startup Week 2018 to moderate a panel on immigrant businesses in Colorado. Alejandro hopes to one day run for public office and will use his upbringing and life experiences to drive his policy agenda. I am looking forward to building a stronger movement that is inclusive and thoughtful of communities of color in paving the way for the next wave of directors, administrators, and activists to become the foundation of Colorado’s social justice ecosystem and framework. John-Claude (J.C.) Futrell (he, his) is a spoken word artist, hip-hop performer, (under the stage name Panama Soweto), husband, father, and educator. He is the Executive Director of Education at RedLine Contemporary Art Center in Denver. His dedication to assisting youth in Denver as a mentor and educator has been demonstrated through his work with The Denver Housing Authority, Red Cross Blue Shield, The Urban League, The Downtown Aurora Visual Arts and ArtsStreet. He is a National Poetry Slam Champion. He has toured institutions of higher learning as one of the country’s top spoken word artists. 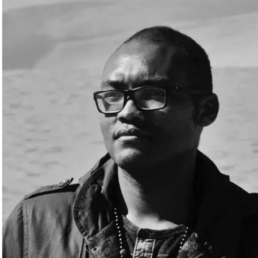 He is also the co-founder of the World Champion Slam Nuba poetry venue. 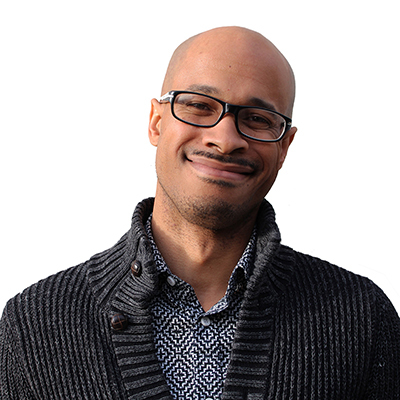 His work has been featured on National Public Radio (NPR), The Huffington Post and the PBS special, “The American Graduate.” In 2015 he was awarded Metropolitan State University’s Distinguished Alumni Award and in the same year won Diversity Artist of the Year from the National Association of Campus Activities. In 2016 he was awarded the Distinguished African Americans Who Make A Difference Award by the Denver Urban Spectrum. He has even shared his poetry during two very special TEDTALK events at Colorado State University. He is also a self-published author, keynote speaker, and visual artist. He was an invited performer for The Black Panther Party’s 40th Anniversary in Harlem, NY and has shared stages with Gil-Scot Heron, Pulitzer Prize winner Yusef Komunyakaa, Public Enemy, Rakim, Talib Kweli, and The Pharcyde. He currently sits on the Denver Art Museum and Central Denver Library’s Public Art Selection Panel Committee. I am looking forward to forming a network of professionals of color, contributing to its sustainability and paving the way for the next generation of directors, administrators, and officers in Colorado who have dedicated their lives to social justice practices. Cisco (he, his) founded and published two positive barrio youth-oriented magazines and founded the non-profit organization Barrio Warriors de Aztlan which dealt with Chicano issues in the political sphere. Cisco is currently the Program Director of the Gang Rescue and Support Project (GRASP). GRASP is a non-profit gang-intervention and leadership project that works with Denver-area youth involved in the gang lifestyle. He has also spoken at national and international conferences. He serves in advisory and consultative roles throughout the nation has been active in the Denver area for over 26 years. 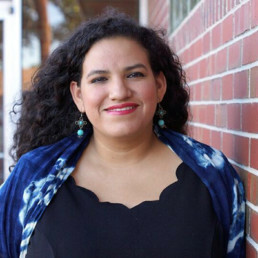 Maggie Gómez (she, hers) has dedicated nearly a decade to grassroots community organizing with women and communities of color to build deep power for collective action. She earned a master’s in social work from the University of Denver and is passionate about organizing for women’s, workers’, immigrant, economic, and racial justice. At Center for Health Progress, Maggie brings her significant experience in organizing, voter engagement, and leadership development to incorporate grassroots community members into the fabric of our work. Maggie served the community as a founding member and Board Chair for the Colorado People’s Alliance, and is currently the co-chair and commissioner on the Colorado Health Equity Commission, a member of the Prime Health Safety Net Advisory Board, a trainer for the Labor Liberation program with Colorado Jobs with Justice, and has experience writing and facilitating popular education curriculum for social justice. I am looking forward to being a part of TLC because I want to deepen my leadership skills and abilities, in order to be a better leader, strategist and visionary. I want to increase my own understanding of my areas of personal strengths and where I need to grow as a person and professional. This is important to me because I want to operate with sincere integrity and with love in my leadership style. I am looking forward to doing this with a community of peers, and to expand my networks of personal and career related support for myself and future leaders of color in CO.
Victoria Gómez Betancourt (she, hers) is a panlatina immigrant with a nonprofit career of 16 years in Colorado. As COLOR’s Development Director, Victoria works to ensure the organization’s financial health while sustaining its growth trajectory. Her grassroots leadership includes professional, volunteer, and board roles across the spectrum of worker’s rights, immigrant rights, human rights, education, and health. Victoria has a bachelor’s in anthropology from the University of Colorado Denver and a master’s in nonprofit management from Regis University. Her role at COLOR and in the reproductive justice movement gives her the opportunity to reconcile and affirm the complexities of being Latinx, sudaca, gender fluid, disabled inmigrante and an abortion positive artivist. Passionate about destigmatization work, Victoria is an active storyteller. Find her on stage performing spoken word pieces or on task with visual art devoted to stigma busting. I am excited to be a part of this collective and begin a journey unlike any other. Hoping to deepen connections with fellow grassroots leaders and to both reinvigorate and expand the ways I contribute to social change. Though what’s ahead remains unknown, I trust we will emerged anew, more resourceful, and recommitted to movement work, our communities, and ourselves. Olga Gonzalez (she, her, hers) Olga is a long-time diversity, equity, and inclusion consultant, seasoned nonprofit professional, and community activist and organizer. She is the CEO of O.G. Consulting Services. Prior to creating her consulting business, she spent the past 24 years working within the nonprofit sector in various roles and has been instrumental in creating programs, curriculums, and policies that center people of color and other underrepresented groups. Olga has also facilitated DEI and leadership trainings nationally and throughout the state of Colorado. She is currently working with several Colorado Trust-funded organizations that have a focus on racial equity as an expert practitioner with the CIRCLE team. She believes that intentional diversity and inclusion work can result in more equitable, compassionate and humane organizations and communities. Olga has participated in numerous trainings and leadership programs related to inclusiveness and equity such as the Visiones Multicultural Leadership Program, Leadership Denver, and Undoing Racism. She is active in her community as a board member for several nonprofit organizations, and as a past member of the Denver SNAP Task Force, and as an Appointed Member of the Colorado Governor’s Council for Active and Healthy Lifestyles. 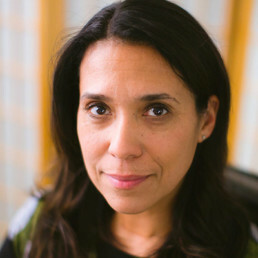 Nationally, she is a member of the Food Trust’s Food and Health Equity National Working Group. Olga has earned several awards and recognition for her work in the areas of inclusiveness, equity, and social justice, including the Mayor’s Award for Outstanding Denver Citizen Committed to Fighting Against Hate and the Award for Excellence in the Promotion of Health Equity from the Public Health in the Rockies Conference. Olga holds a dual bachelor’s degree in psychology and Chicano studies from Scripps College in Claremont, CA. She also earned a master’s degree in nonprofit management from Regis University as a Colorado Trust Fellow. Olga is a MeXicanIndia (Yaqui/Otomi) woman who was born in Mexico, and along with her parents, crossed the illegal US border when she was 4 years old. Olga is also the proud mother of three amazing children; Nez (18), Ximalma (8) and Xareni (5), who she is raising to be the next generation of fierce and compassionate social justice warriors. She is married to Malik Robinson and together, they like to eat, travel and teach Zumba classes. Salvador Hernandez (he, him, his) is the Civic Engagement Coordinator for Mi Familia Vota. As part of Mi Familia Vota, he has successfully led voter registration campaigns in Nevada and Colorado registering more than 40,000 people to vote and turn out thousands of Latinos to the polls. Born in Chihuahua, Mexico in the outskirts of the Sierra Madre Occidental, Salvador grew up with his 3 siblings and parents. As a young boy he liked to play soccer and ride his bicycle with his friends. He moved to Las Vegas, NV at the age of 15 with his mother and siblings in search of a better future. There, while still in High School, he volunteered a local campaigns to raise the awareness of Latinos in the electoral process. He then moved to the Centennial State on 2014 to register to vote and turnout Latinos in the Midterm elections as an organizer with Mi Familia Vota. 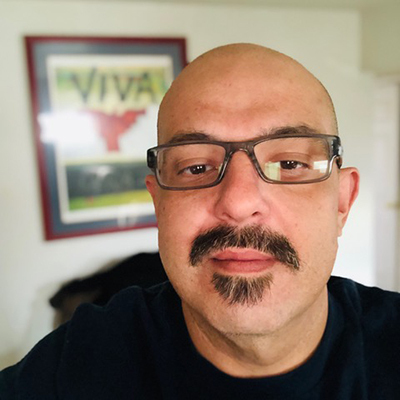 One of his major inspirations is his High School History teacher, Isaac Barron, who taught him how to be a better person and to fight for justice for the rights of immigrants in this country. Salvador graduated from the College of Southern Nevada and majored in business administration. He loves dogs and likes watching Stanley Kubrick films. I am looking forward to learning, sharing and thinking critically on how we can build a stronger movement that is inclusive and fair to lead the fight for justice in Colorado. Yessica Xytlalli Holguin (she, hers) leads the Community Wealth Building Network (CWBN), an initiative that promotes strategies for an inclusive economy. Most recently, Yessica was a Country Director at Project Gettysburg-León (PGL), an international sister-city organization that works to empower Nicaraguans to be the leaders of their own development. In this role, Yessica worked with local leaders, organizations, and government agencies to build capacity and create partnerships that leverage resources and promote sustainable development. Prior to PGL, Yessica served the United States of America as a Small Business Development Specialist in the city of Estelí in northern Nicaragua through the Peace Corps. In this capacity, Yessica worked with small businesses to help them grow from micro enterprises to small and medium-sized businesses. She also worked with local leaders to organize savings and lending circles to promote savings and affordable access to credit in their community. Prior to her work in Nicaragua, Yessica worked at the Denver Scholarship Foundation where she was among the initial staff of the organization that helped design the college and financial aid advising program in Denver high schools. Yessica earned a Bachelor of Science degree in Business Administration with an emphasis in Information Systems, a minor in Latin American literature, and a Master of Science in Management and Organization with a track in Human Resources from the University of Colorado Denver. 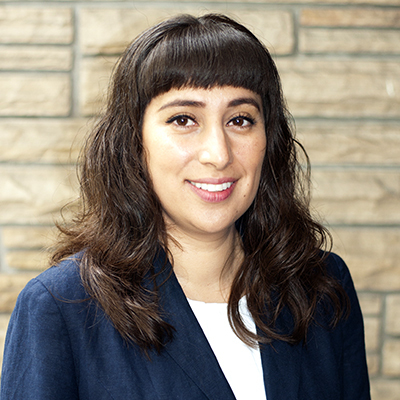 Yessica grew up in the Swansea neighborhood in Denver and has done grassroots community organizing with immigrant groups and low-income communities across the Denver Metro area since 2000. She has dedicated her life to empowering disenfranchised communities to break the cycle of poverty through education and economic development. She enjoys running, reading, and spending time with friends and family while drinking coffee. Through TLC, I look forward to building my community of movement builders to tap into our collective power to inspire, transform, and foster an environment where everyone can thrive, including ourselves. 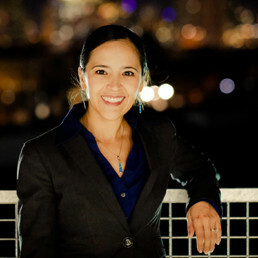 Judith Márquez Romero (she, her, hers) chairs the CO FAMLI coalition for 9to5 Colorado. She joined 9to5 in 2016 after several years of organizing for Centro Humanitario, formerly FRESC- Good Jobs, Strong Communities, and Rights for All People. Judith brings a decade of experience working on legislative campaigns, ballot initiatives, and voter education campaigns. She also has extensive experience with member recruitment and leadership development, as well as advocacy and education for racial and economic justice. Judith’s work has focused on a variety of issues that impact low-income and marginalized communities, including labor rights issues, combating wage theft, and increasing the minimum wage. She has also advanced immigrant rights through advocacy work to stop family separation and decrease the collaboration of local law enforcement with ICE. Having grown up as a daughter of Mexican immigrant parents, Judith roots her work in her own family and community’s struggle for justice. She is passionate to bring an anti-oppression and intersectional frame in recognition that all of our struggles are intimately connected and our liberation is bound to each other. I’m looking forward to build transformative relationships with my cohort and through this process strengthen our personal foundation and re-imagine how we do social justice work in Colorado. Celesté Martinez (she,hers) is the Organizing Director for United for a New Economy. She joined in 2018 to strengthen UNE’s commitment to being a powerful member led organization for Colorado. Celesté lived in El Salvador in 2014, where she saw first hand how U.S. foreign policy contributes to poverty, gang violence and forced migration of Central Americans. Upon her return to Colorado, she worked for El Centro Humanitario para los Trabajadores furthering her passion to fight for racial, economic and immigrant justice. 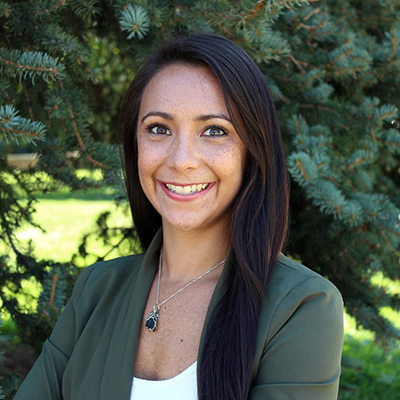 Celesté previously worked as a Bilingual Organizer with Together Colorado,. There she organized with multi-cultural Catholic parishes in the greater Metro-Denver area as well as led the local, state and national efforts for immigrant rights. I am looking forward to strengthening my relationships with fellow leaders of color, who share my aspiration to heal and transform Colorado. 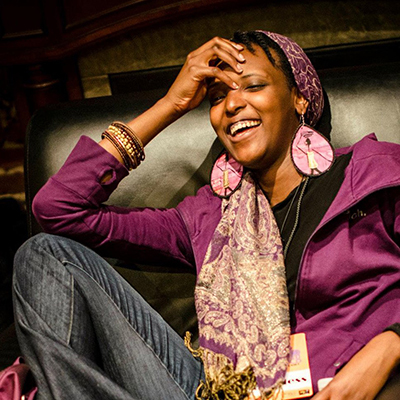 Bianca Mikahn (she,her, they, them) is an emcee, poet, digital composer, cultural activist and educator. Mikahn is currently Executive Director of youth mental health based program Check Your Head and a Partner Artist with leading creative educators Think360 and Youth On Record. Addressing stigma reduction and mental health for marginalized peoples, Mikahn recently explored these themes through a TedX talk titled “From scars to Strength; The Poetry of Recovery”. Whether performing alone or with her self-produced duo The Maybe Sos, her stage presence and lyrical content have earned multiple nominations for “Best Emcee” as well as a feature in the “100 Colorado Creatives” series from Denver’s Westword publication. She has shared stages at Regis University, Denver University, the Chateau de La Napoule in Nice, France and Stockholm Sweden’s historical Fylkengin Theatre. Her lyrical work has been featured in social justice studies at Wyoming University and University of Northern Colorado. Her current efforts are focused on honing social emotional learning and arts-based facilitation to encourage trauma informed care and Mental Health First Aid (adult and youth modules) in under-served communities. I am beyond excited to celebrate and learn from my fellow cohort members, and extremely honored to be included in these efforts to reshape and re-imagine our communities! Kevin Patterson (they, them, theirs) was born and raised in Colorado. Early on in they’re life, they were engaged in local politics. After Kevin completed their high school education at the Denver School of the Arts, they went on to receive two Bachelor’s degrees in Ethnic Studies and Political Science at the University of Colorado Boulder. As a student, Kevin was a part of various student groups and coalitions such as United Mexican American Students y Movimiento Estudiantil Chicanx de Aztlán de CU Boulder, Queer, and Trans* People of Color, Black Student Alliance, Student Outreach Center for Equity, and forming the Pulse (Student Government). Their involvement in these efforts to lead a deep commitment to the pursuit of social justice for marginalized communities. After graduating they interned with The American Federation of Labor and Congress of Industrial Organizations Union Summer working with K-12 teacher to fight for healthcare in their school districts. After their internship, Kevin continued to work with the American Federation of Teachers at the Temple University, Cayuga Community College, and Community College of Allegheny County unionizing campaigns. After their stint on the east coast, Kevin returned to Colorado to build power. Kevin since returning oversaw the Aurora City Council Elections of 2017 and 2018 election field programs where Colorado People’s Action (CPA). I look forward to engaging with this awesome cohort to reimagine what we can collectively accomplish in Colorado together by beginning the process deepening a collective commitment to transformative leadership form the awesome organizing this cohort represents! Victor Galván (he, his, him) is a Rocky Mountain native and was born in Chihuahua, Mexico. He began organizing in the immigrant community in 2008 at age 16 through Padres Y Jóvenes Unidos. In 2012, Victor joined the CIRC team to help mobilize Latino and immigrant voters in the general election and was instrumental in the campaign to win ASSET in-state tuition equity in 2013. Victor’s voice helped to ensure that ASSET included state-funded scholarships for undocumented students. He proudly identifies himself as Undocumented and unafraid. He has continued to lead CIRC’s voter engagement campaign as the Director of Membership and Engagement. He is on track to complete a voter campaign of over 50,000 doors and 73,000 phone calls in order to turn out close to 5,000 minority and immigrant voters in the state of Colorado’s 2018 election. Through the TLC Fellowship I am hoping to improve my skills as a director in my organization through the expertise and skills of others in the program and I hope that I can help share my skills as a coalition and movement builder. Not only am I committed to seeking new ways of leading my organization but how to lead from the back and learn how to lift up and prop up other in order to reach our goals not only to create opportunities but to also to focus on legacy and leaving something sustainable after i am gone. Alma Urbano (she, hers) is an educator, and emerging leader serving as Program Manager at Project VOYCE. She joined the Project VOYCE team after receiving her Bachelor of Arts in Sociology from Kenyon College. She herself is an alumna of the Project VOYCE summer academy where she learned to value her own narrative while addressing issues of health and immigration in her own community. She is also a neighborhood member of the Globeville, Elyria-Swansea Coalition currently working to set up a community land trust. An immigrant and DACA-holder, Alma is thankful to her Northeast Denver community which has welcomed her and her family since they first came to the US in 2006. Her own experiences as a young Latinx immigrant in a gentrifying neighborhood have inspired much of interest in youth activism. Now and in the future, she hopes to continue her work capturing, valuing, and empowering the younger voices of Denver, Colorado as many of our communities continue to evolve. I am looking forward to collectively explore our own vulnerabilities and strengths to better support our communities in a compassionate and proactive manner. Assétou Xango is a profound speaker, facilitator, storyteller and activist. Xango specializes in topics of women’s empowerment, genderqueer rights and racial issues. She utilizes story-telling and honest conversations to divulge and address areas of disparity in our systems and community. 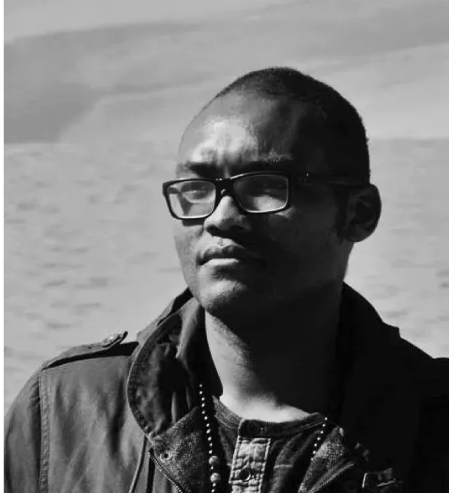 In their decade long career as a speaker, Xango has received accolades from international poetry competitions, was featured in Westword’s top 100 Creatives and Is a two time at TEDxMileHigh speaker. Xango is currently the Poet Laureate of Aurora (2017-2019). As a community activist, she has founded several community forums to address issues from race to gender both locally and nationally in San Francisco. Assetou has a BFA in Film Production and is pursuing a Masters in Sociology. 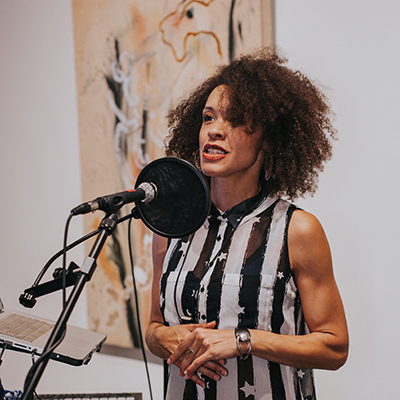 She uses the arts and public speaking to empower adults and youth alike to engage difficult topics and self-discovery around power and privilege and the systemic ways it exists in the institutions we inhabit. Xango has trained extensively in conflict transformation, de-escalating conflict and trauma informed care. They founded this organization, Giving Ground, in partnership with Leanne Alaman after observing the strengths and deficits in organization out to do good. Xango is excited for the launch of this organization because it combines all of her strengths and passions to help good organizations do better in the areas of equitability and conflict transformation. Xango feels honored to be apart of such a powerful collective as Transformative Leadership Collective (TLC). TLC has already left such a strong legacy in Denver, she is grateful to be apart of it.